I haven’t played regularly on ICC in years, but earlier today, I decided to play a couple blitz games. 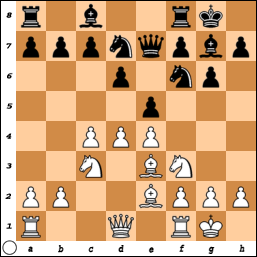 I joined the 5-minute pool and found myself with the white pieces against IM Garun Nureev. His 5-minute rating was about 100 points higher than mine at about 2540. 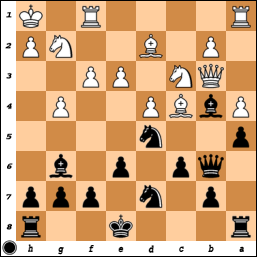 It began as a Classical King’s Indian, with Nureev choosing the old …Nbd7 line. 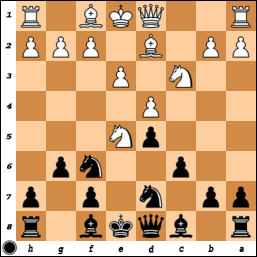 Black surprised me with 8…Qe7 and after a little bit of thought, I played 9.Re1. Not apparently the most popular move (that’d be 9.Qc2, while 9.Re1 seems to have only been played once in the last 15 years according to my database), but it seems kind of obvious to me.